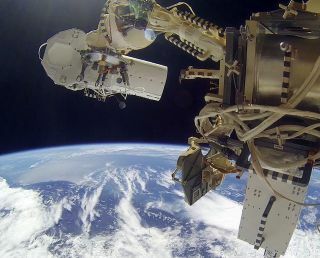 The two commercial cameras that will keep a constant watch over Earth from outside the International Space Station have beamed their first bits of test data back home. The Vancouver-based company UrtheCast has not publicly released any pictures of videos showing its cameras' view of the planet just yet. But company officials announced this week that they have successfully downlinked camera data to the ground station in Moscow from both their high-resolution camera and medium-resolution camera. They've even acquired test imagery from the medium-resolution device. By passing this test, UrtheCast (pronounced "EarthCast") is a step closer to its goal of providing Internet users and commercial clients with a stream of near-real time continuous footage of Earth. "With both cameras functioning as anticipated, we are now focusing on further commissioning and calibration of the cameras and the pointing platform for the HRC [high-resolution camera]," UrtheCast’s chief technology officer, George Tyc, said in a statement. This step is necessary before imagery can be acquired from the HRC. Tyc added that the first "official full color, Ultra HD video" would be released in the second quarter of the year. The cameras launched to the space station in November as part of Russian cargo delivery and were installed on the hull of the orbiting outpost during a spacewalk by Russian cosmonauts Oleg Kotov and Sergey Ryazanskiy on Jan. 27. An initial attempt to fix the cameras to the station in December had to be abandoned after the devices hit a communications glitch. The cameras will capture stills and video of the planet from the viewpoint of the space station, which circles the globe every 90 minutes at an average altitude of 248 miles (400 kilometers). The medium-resolution camera will record 30-mile-wide (50 kilometers) swathes of imagery and will be able to make out objects about 19 feet (6 meters) across or larger. The high-resolution camera, meanwhile, will be able to resolve targets as small as 3.3 feet (1 meter) across, according to UrtheCast.